I want to go over a setup intensive shot, since I haven’t done one yet, called “Epiphany.” I call it that because I practiced this without success and then Paul “Book ‘Em” Danno played it against me in a tournament and I finally figured it out on the fly. For this shot, we have four balls in a right angle configuration. I start with the ‘F2’ and ‘A’ balls and place them one ball width from the foot cushion with the ‘F2’ ball even with the first diamond. Set the ‘C’ ball so the ‘C’-‘A’ tangent line goes straight in to pocket ‘C’. Finally, align the ‘F1’-‘C’ tangent towards the long rail point of pocket ‘F’. I put the cue ball behind the foot string in line between the ‘F1’ ball and pocket ‘A’. I aim for a ½ ball hit on the ‘F1’ ball and let it fly. The important part about practicing this shot is seeing how you’re missing certain balls. The ‘F1’ ball and ‘A’ balls are the easiest to miss. With the ‘F1’ ball, just move the tangent line until it goes in. 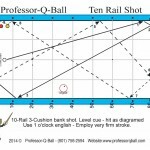 For the ‘A’ ball, move the entire setup in between the long rails to adjust for the bank. The shot is speed sensitive too, so make sure you’re consistent with that. You can learn a lot of principles from setup shots that you can further apply to typical pool games. The ‘F2’ ball should be automatic. Even though it’s aligned straight across the table with the ‘A’ ball, it should throw into the pocket easily. The ‘A’ ball will pick up spin from the ‘C’ ball which will bank it towards pocket ‘A’ (remember the Backward Bank shot in the April issue last year?). 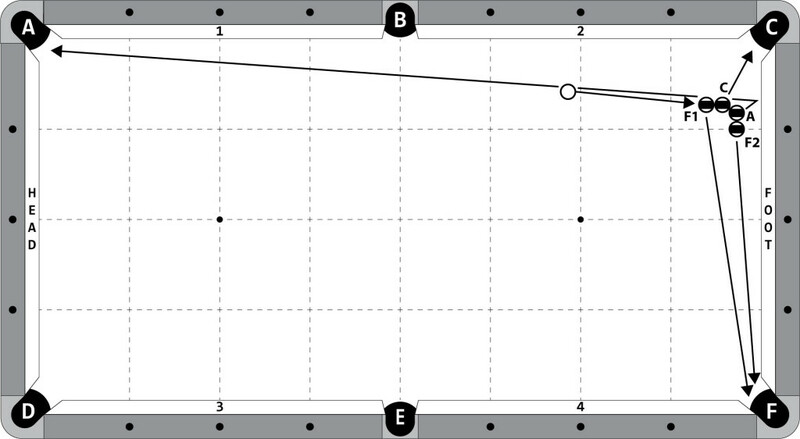 Changing the ‘C’-‘A’ tangent line will affect how much spin ‘A’ picks up. The ‘F1’ and ‘C’ balls are mostly determined by the tangent lines, but you can throw these off depending on your cut angle and if you use any spin.